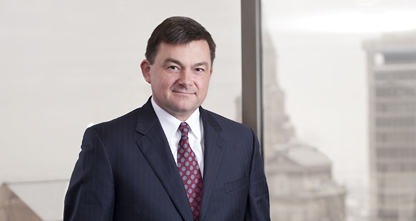 Andrew Ryan is a partner in Cantor Colburn’s Litigation Department and chairs the firm’s Post Grant Practice. He is a trial lawyer with almost 20 years' experience representing plaintiffs and defendants in patent cases and other intellectual property and complex litigation matters. He also has significant experience in inter partes review (IPR) and other adversarial proceedings in the U.S. Patent and Trademark Office. Andy has experience in a wide variety of industry areas, including electronics and semiconductors, robotics, automotive components, medical devices, pharmaceuticals, and biotechnology. He has participated in and led matters before the U.S. District Courts of CT, MA, NY, NJ, DE, FL, CA, TX, the Patent Trial and Appeals Board (PTAB), the International Trade Commission (ITC), and the U.S. Court of Appeals for the Federal Circuit. Andy is experienced in the fields of patents, trademarks, trade dress, unfair competition, copyrights and trade secrets. He has represented clients in federal and state court in bench and jury trials, preliminary injunction proceedings, and in appellate matters. Andy's trial experience includes cases involving a variety of technologies, including shape memory alloys, medical stent technology, restorative dental materials, and industrial safety products, including earplugs and protective eye wear. On April 24, 2018, the Supreme Court issued two important decisions in the cases of Oil States Energy Services, LLC v. Greene’s Energy Group, LLC, et al., and SAS Institute Inc. v. Iancu, addressing inter partes review (IPR). Both cases will have a significant impact on IPR proceedings. In sum and as discussed in greater detail in Cantor Colburn's Client Alert, the Court determined that (1) IPR proceedings are indeed constitutional, and (2) the Patent Trial and Appeal Board (PTAB) must address all challenged claims in the final written decision.